OKLAHOMA CITY (AP) — Forced to play overtime after blowing a 20-point second-half lead, the Toronto Raptors found their groove again in the extra period. 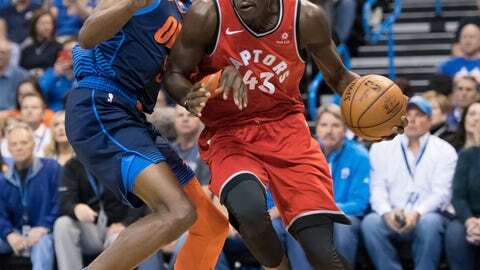 Pascal Siakam had 33 points and 13 rebounds, Fred VanVleet added 23 points and six assists and the Raptors won the first of two games in three days against Oklahoma City, outscoring the Thunder 13-4 in OT to pull out a 123-114 win Wednesday night. Atlantic Division-leading Toronto snapped a four-game losing streak against Oklahoma City despite the absence of starting guard Kyle Lowry, who sat out with a sprained right ankle sustained Monday in a win over the New York Knicks. The Raptors did so with balanced scoring, good ball movement — four players had six assists — and strong shooting, making 51.7 percent overall and 38.9 percent from 3-point range (14 of 36). Kawhi Leonard added 22 points and 10 rebounds, while Danny Green scored 17. In his return from a one-game suspension for accumulating too many technical fouls, Russell Westbrook had 42 points, 11 rebounds and six assists for Oklahoma City, which has lost four straight games and 10 of 14. The Thunder entered sixth in the Western Conference but just a half-game out of eighth place. Toronto led 78-58 in the third quarter but the Thunder steadily chipped away and pulled to 110-108 on a 3-pointer by George with 39.9 seconds left in regulation. He fouled out with 19.9 seconds to go while scrambling for a rebound after a missed shot by VanVleet, but another miss by VanVleet led to a driving layup by Westbrook with 4.8 seconds left to tie it. In overtime, the Thunder missed their first seven shots, allowing Toronto to pull away again. A driving layup by VanVleet with 58.4 seconds left and a three-point play by Leonard with 35.5 seconds left gave the Raptors a 119-110 lead. George scored 19 points for Oklahoma City, which made 13 of 43 3-point attempts (30.2 percent) and 15 of 29 free throws (51.7 percent). The Thunder retired Nick Collison’s No. 4 jersey in a pregame ceremony, the first time the franchise has so honored a player since its move to Oklahoma City in 2008. The Seattle SuperSonics drafted Collison out of Kansas in 2003 and he spent his entire 15-year career with the club. Among his former Thunder teammates who attended the ceremony were Kevin Durant of Golden State and Serge Ibaka of the Raptors. Neither was mentioned in Collison’s pregame speech, but Westbrook was. Raptors: Nurse didn’t seem too concerned about Lowry’s injury: “He’s just sore. Nothing serious. They’ve checked it every way it can be checked.” VanVleet started in Lowry’s place. … Siakam’s double-double was his 16th of the season. . Toronto’s 21 wins against Western Conference foes this season are a franchise record. Thunder: Consecutive games against an opponent aren’t new to the Thunder. OKC played at Dallas on Dec. 30 and hosted the Mavericks on Dec. 31. … Backup C Nerlens Noel returned after missing one game with a bruised left quad. Raptors: Host the Thunder on Friday. Thunder: Visit the Raptors on Friday.